The Justice League has been busy lately with December’s Justice League vs. Suicide Squad and now we’re treated to the Justice League in a comic with the Mighty Morphin’ Power Rangers. 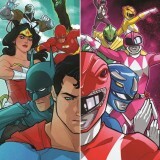 A very unlikely crossover on paper but is this debut issue a Morphinomenal one? Tom Taylor helms the writing duties for this crossover and it’s nice to see him start the event from the Power Rangers themselves, a team he’s not usually associated with as readers know him as someone who’s held on to DC’s Injustice for a very long time. 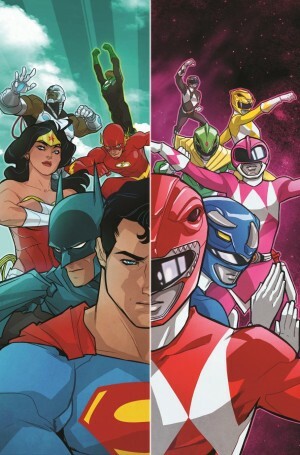 While this debut issue doesn’t show the whole Justice League yet, Taylor makes up for it with some snappy dialogue and a rather dark setup on how the Power Rangers end up in the Justice League’s earth. Outside of the setup, Taylor does a bit of focus on Zack, the Black Ranger, treating readers to some high stakes drama and not just the exciting factor of this event. Part of why this comic is exciting is because of Stephen Byrne‘s helming of art duties, both the main art and coloring. Byrne’s art is pretty much the combination of the art from the main Mighty Morphin’ Power Rangers comic and the Mighty Morphin’ Power Rangers: PINK comic, showcasing a lot of cleanly made lineart complimented with a gorgeous color palette. It’s a spectacle to see characters fight along an environment that’s experienced an explosion. I was excited when this crossover was announced because it was gonna be the first time these two teams would meet and it truly didn’t disappoint. What adds to Justice League Power Rangers #1 was the gorgeous art by Stephen Byrne and Tom Taylor’s unexpected focus on the Black Ranger that adds depth to this crossover. Truly a Morphinomenal event worth sticking around for. REVIEW: Is ‘Batman: White Knight’ Today’s The Dark Knight Returns?